The opening session of Day Two at Slam Dunk to the Beach featured some high-flying fireworks and three impressive team efforts by the victors. Mount St. Joseph (MD) got the day started with a 63-47 triumph over St. Georges (DE). That was followed by fifth-ranked Roselle Catholic’s (NJ) 71-55 win against The Haverford School (PA). The session wrapped up with Saints Neumann And Goretti (PA) routing Sanford (DE), 65-47. St. Georges jumped out to an early 13-4 edge in game one, but a 30-second timeout by Mount St. Joseph coupled with a defensive adjustment keyed a run by the Gaels. A suffocating full-court press led to five St. Georges turnovers in the final 3:41 of the opening quarter and got Mount St. Joseph to within 17-16 after eight minutes. The defensive surge continued into the second period as St. Georges went scoreless over the first three minutes and committed three more turnovers during that stretch. The Seahawks went almost six full minutes without a field goal and finished the first half with 10 giveaways. Mount St. Joseph took a 26-24 edge into intermission. The pressure persisted into the second half, as St. Georges continued to rush shots and turn the ball over. Mount St. Joseph scored the first nine points of the third quarter and kept St. Georges off the board for almost four minutes to open up a double-digit edge, 35-24. The offense took over from their for Mount St. Joseph. Nigel Jackson knocked down a trio of treys as the lead swelled to as large as 22 in the fourth quarter. Jackson led the Gaels with 17 points, 15 of which came after the break. Darryl Morsell added 12 points while Randy Miller had 11. “Nigel’s a really good shooter,” Clatchey said. “He’s only a sophomore and he got hot, but guys were finding him. He just had the confidence and the rhythm to really knock shots down. The ball found him, and I told him, ‘I’m a big believer that when you do the hustle and the effort things, God rewards you.’ When he dove on the floor and came up with the loose ball and got us a bucket, the basketball Gods just said it was time for Jackson to have a great game, and he did. Kyson Rawls carried St. Georges with 18 points, nine rebounds and three steals. 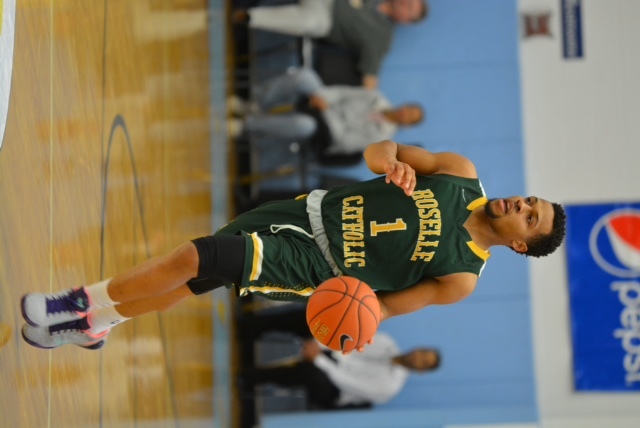 Game two was competitive for the better part of three quarters before Roselle Catholic pulled away down the stretch. Haverford held a one-point lead after one quarter and trailed by only eight at the break. The Fords got to within five points midway through the third period thanks to the yeoman efforts of freshman Cameron Reddish, who finished with 25 points on only 13 shot attempts. But Roselle Catholic’s depth eventually caught up to Haverford, and a 12-2 spurt late in the third put the game away. 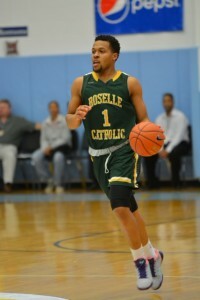 Isaiah Briscoe, the top-rated point guard in the class of 2015 by ESPN.com, led the Lions with 23 points. He also created the two most memorable moments of the day. His pass off the backboard setup teammate Chris Silva for a fast-break flush early in the fourth quarter, which brought the near-capacity crowd to its feet. He then gave the fans another thrill when he got a steal and threw down a thunderous one-hand jam in transition later in the period. As his head coach Dave Boff described it afterward, Briscoe and his teammates were just enjoying the moment. In the finale, Saints Neumann And Goretti proved too strong for Sanford. The Saints erupted in the second quarter for 22 points, doing much of the damage in transition. Saints head coach Carl Arrigale said it’s an aspect of the game his team works at every single day. Sophomore Quade Green had another big game for Neumann-Goretti. After dropping 27 in a win over Gill St. Bernard’s, Green added 22 more on Sunday. Most impressive was the fact that he needed just 11 shots to do it. Mikey Dixon led the way in a losing cause for Sanford with 20 points. Eric Ayala added 12 for the Warriors. Slam Dunk to the Beach continues on Sunday with three more games during the second session. The action gets underway at 6 p.m. as Sunrise Christian (KS) takes on Christ The King (NY). It continues at 7:30 p.m. when Salesianum (DE) gets a shot at USA Today’s No. 36 team in the nation, St. Vincent-St. Mary (OH), and then concludes at 9 p.m. when Gonzaga College (DC) battles Gill St. Bernard’s (NJ). You’ve got to have some fun, man. I mean its high school basketball and when push comes to shove these are kids playing a game and it’s supposed to be fun. At the level we’re at, sometimes the fun gets sucked out of it by a bunch of things, and when they have the opportunity to enjoy themselves and be kids, I hope that they do that and I expect them to have fun. big lead up at halftime. I wish we could have got everyone in the game and stuff like that, but you know, I mean hopefully you learn a lesson from it and you can get better. Last time, we had a big halftime lead, we pushed it up, and you know, everyone was able to get in the game, so I don’t know if they expected it to happen, but this team is a little better than the last team, so give them credit.